"My grandmother used to make this, but she used saltines and straight cranberry. I've adapted it to fit our family's taste." Chill a large metal bowl in the refrigerator or freezer, about 15 minutes. Mix whole berry cranberry sauce and jellied cranberry sauce together in a bowl. Place graham crackers in a large resealable plastic bag and crush with a rolling pin into crumbs. Pour heavy cream into the chilled bowl and whip with an electric mixer on high speed until soft peaks form, about 2 minutes. Add sugar and vanilla extract; whip until medium peaks form, about 2 minutes more. 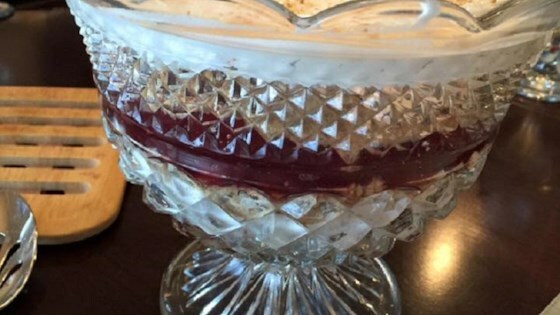 Place half of the graham cracker crumbs in the bottom of a trifle bowl. Top with half of the cranberry mixture and whipped cream. Repeat layers, ending with whipped cream. Chill until set, at least 3 hours. Go full-on brulee with your pumpkin! This is usually the first dish gone during the holidays. Kids love it. It's sweet, so if too sweet with the graham crackers, you can use the saltines.